A remarkably simple block, a basic Flying Geese block consists of a larger triangle (the goose) surrounded by two smaller triangles (the sky). These blocks are usually made so they are twice as wide as they are tall. Choosing fabrics with enough light-dark contrast is essential to make the geese stand out against the background of sky. If the goose fabric is dark, the sky should be lighter; on the other hand, if the the goose fabric is light, the sky should be darker. It is a versatile block that can be used in any number of ways, such as the easy, yet intriguing Dutchmans Puzzle block, as well as in combination with other blocks. 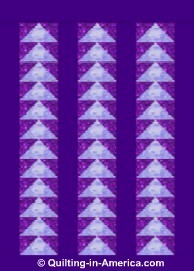 Series of the triangular birds also makes an attractive border or sashing design. 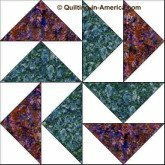 The Flying Geese block is frequently used in combination with solid blocks for an entire quilt top. With the strong contrast of light and dark triangles the illusion of the outspread wings and a follow-the-leader formation of migrating birds becomes evident. 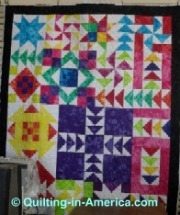 In this brightly colored example of traditional quilt blocks done in a very contemporary fashion, Darlene Hood, of Darlene's Sewing ETC, combines vivid colors and unconventional placement of stars, squares, and Flying Geese blocks. Going in and around the stars, the colorful triangular birds provide excitement and a sense of motion to the design. Make a Flying Home quilt using 2 1/2" strips and easy flying geese blocks. Make a beautiful Take Flight Quilt using 5 inch squares. Linear, with lots of white space to highlight your quilting.